Nestled right across from The Palisades, your view is spectacular year round! 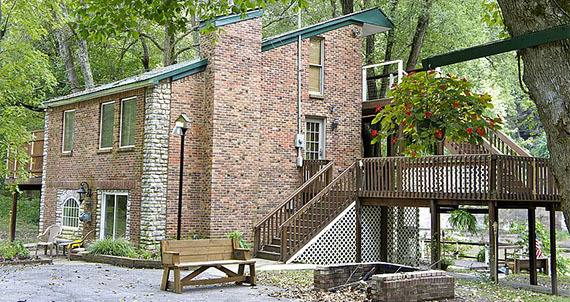 Whether your here for the weekend or a week, you will get the serenity of the Kentucky River plus the convenience of being minutes away from local shopping, events, and attractions. Each of the three suites come equipped with their own bedroom, bathroom, and kitchen areas. "Thank you for providing such a wonderful stay. The scenery was so beautiful, and the cottage was everything we needed for our weekend. We appreciated your recommendation of the Jean Farris Winery; the food was excellent. The cottage, while feeling like we were miles from any city, was very conveniently located close to everything. I have sent pictures to all of my family because I want them to go down and enjoy your beautiful place, as well! We are planning to return next Spring."